The Japan High School Baseball Federation (JHBF) announced the names of 36 high school baseball teams across Japan to play at the 85th National Invitational Tournament at Koshien Stadium in Nishinomiya. Each year JHBF selects a few teams to take part that have served as a model school in some way irrespective of their game winning records. 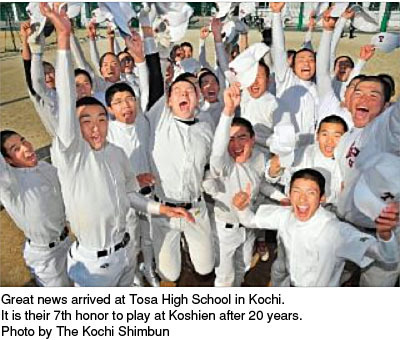 Iwaki Kaisei High School Baseball Club in Fukushima which suffered devastating Tsunami damage at the Great East Japan Earthquake in 2011 has been chosen for their courage to recover from the disaster. 10 teams out of total 36 participate in the tournament for the first time. The tournament lasts for 13 days from March 22 and is the forerunner to 2013 baseball season in Japan.